This picture has been contributed by Dr. Ajay Agarwal, Consultant Neurosurgeon, Calcutta Medical Research Institute (CMRI), Kolkata, West Bengal. Come Autumn and the cirrocumulus clouds start weaving scattered patterns in the sky. The setting sun lights them up with colourful shades. The scene continues to change every minute till the sun disappears below the horizon leaving the viewer spellbound in Nature's creativity. The show is not limited to the mountains and beaches, where people travel miles to visit a sunrise- or a sunset-point. These spots are present in our cities too, frequently detectable if only we would take time off from the humdrum of our daily lives and look beyond the concrete which surrounds us. 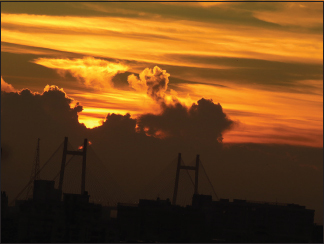 This picture was captured one such evening in Kolkata, West Bengal. In the silhouette, one sees the pylons of Vidyasagar Setu, the bridge named after the 19th century Bengal reformist, Ishwar Chandra Vidyasagar. It is a landmark bridge which connects the city of Kolkata with its twin Howrah over the Hooghly river. It is also referred to as the Second Hooghly Bridge, the first being the famous Howrah Bridge. It is a cable stayed bridge, hanging by 121 cables in a fan-shaped arrangement from the 128 m high pylons on either side of the river. Its construction started in 1978; it was completed and inaugurated in 1992. It is a 35 m wide bridge and supports three lanes of traffic on either side. It has a clearance below of 26 m to allow for river traffic. It has a span of 457 m, the total length being 823 m, making it one of the longest bridges in the country. 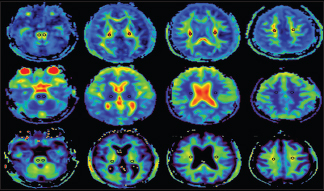 Chen H, Jiang L, Zhang H, Zhang YD, Geng W, Feng Y, Chen Q, Chen YC, Xindao Yin X. Corticospinal tract changes in acute brainstem ischemic stroke patients: A diffusion kurtosis imaging study. Neurol India 2018:66.726-32. Joseph J, Behari S, Gupta S, Bhaisora KS, Gandhi A, Srivastava A, Jaiswal AK. Brain-stem hemangioblastomas: The seemingly innocuous lesion in a perilous location. Neurol India 2018:66.779-96.